This week’s feature is from Amanda Pruett, a wife, mother, and entrepreneur. Amanda was diagnosed with a rare condition in the early weeks of her first pregnancy, called a bicornuate uterus. She will be sharing her story of pregnancy and conceiving with this condition, and how it has shaped her journey into motherhood. Amanda spends her days enjoying little moments with her family such as splashing in the pool with her boys and playing with her chocolate lab Emmy when she is not at her full time day job. Amanda also has a creative side, and enjoys crafting for her business Simply Sweet Designs. You can find her watching movies with her husband, cutting/staining/making custom signs in her garage, or baking in the kitchen when she isn’t wrangling her two littles, Ryker (age 2) and Rowan (age 1). Thank you Amanda for being a part of our Real-Girls: Mothers community! Finding magic in the midst of motherhood + marriage is something we are all doing, together. Motherhood is not easy for every mama, and goodness knows it takes time to adjust into that new role. Read below for Amanda’s story about facing her fears through pregnancy! I found out I was pregnant for the first time just before Thanksgiving in 2014. I felt all the things most women feel: excitement, worry, nervousness, joy, fear. I was just thrilled to be on this journey, to watch my belly grow, to feel baby kicks, to find out if we would have a son or a daughter. I was looking forward to every blissful part of pregnancy. After taking about 6 pregnancy tests (I was convinced I was reading the tests wrong LOL), I made an appointment with my doctor and went in to finally see this little life we had created. After my OBGYN started the ultrasound, I noticed she was getting concerned as she searched for the baby. And then I heard the words I’m sure no woman wants to hear during an ultrasound: “…That’s interesting.” I panicked. As she began to explain what she was seeing, all I heard were complex medical terms that I didn’t understand — I was completely lost and confused. After seeing a specialist who performed a more complex ultrasound, it was discovered that I have a bicornuate uterus. Most people have no idea what that is. I sure didn’t. Having a bicornuate uterus means that my uterus is split down the middle creating two sides, in a heart shape. After doing a ton of research attempting to really understand what I have, I was devastated to discover that the risks and complications of having this type of uterus are very high. The miscarriage rate is much higher, preterm labor is expected, birth defects are 4x more likely, and c-sections are almost always the end result. I cried for days. I thought I was “damaged.” I thought I would lose the baby I had already began loving more than anything…I thought I wouldn’t be able to have children at all. 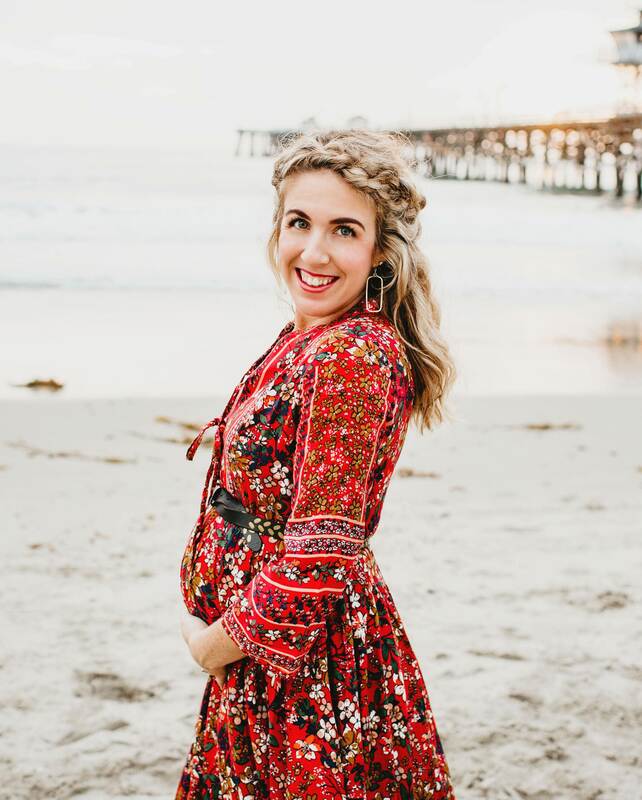 We were forced to take things week by week since my pregnancy was considered “high risk.” Because this condition is rare, my doctor only had so much information and history on how those types of pregnancies go. We had no idea what would happen or what to expect, which put us on a mental and emotional roller coaster as brand new parents. Fortunately, as the weeks went on, we were told that I was growing a healthy baby boy. Overall, I was doing really well and continued to work into my second trimester. However, at 29 weeks I was put on bed rest because we discovered at one of my ultrasounds that the baby was starting to make his way out. It was at that point that I had to receive steroid shots, went to ultrasounds every week, and the only things I was allowed to do outside of being on bed rest was go to the restroom and take a shower. It was miserable, but I just wanted that boy to stay put as long as possible. We were emotionally and mentally preparing to have a c-section when the time came, and I had to force myself to be okay with having a preterm baby. It was a struggle to accept this, since I so badly wanted to push my baby out myself and deliver in the way I wanted to deliver. At 38 weeks and 2 days pregnant I went in for another routine weekly ultrasound — but this time, my doctor took one look and sent me straight to the hospital. Apparently I was 8 cm dilated and having contractions. I had no idea I was that far along in labor! After walking around for a total of 6 hours trying to get my water to break at the hospital, my doctor came in and broke it. By that time, I was already 10 cm dilated and ready to have this baby. It was at this point that I told them I wanted to try to do it my way — luckily this boy moved positions (he was breech the entire pregnancy) and got himself head down. After two hours of contractions, I knew it was time…my doctor arrived, and my son came out on the second push. He was a happy, healthy, and perfect little boy, despite me being diagnosed with having a bicornuate uterus. As I sat there staring at the most amazing gift God could give me, I realized that I beat the odds. I made it full term. I didn’t lose my baby. I didn’t have to have a c-section. My boy was just as he should have been. After doing more research since having my son, I found a few people online who have a similar condition as I do. It was a relief to find out that I wasn’t alone. While having a bicornuate uterus is very rare, there are many women out there who struggle with this just like I do. I’m blessed to now have two beautiful boys, even though they were both born early at 36+ weeks. Yes, I was on bed rest with both. Yes, it was a gamble not know what would happen both pregnancies. But, I wouldn’t go back and change a single thing. The struggle we face now is attempting to conceive for a third time. We don’t know if my condition is directly causing my infertility or if we’re just having bad luck, but it’s been about seven months and we continue to see that little negative sign. It’s discouraging and disappointing. But, I am choosing to search for the silver linings — maybe God only had plans for the two little blessings we already have. Maybe now just isn’t the time He has chosen. Maybe I’m facing other infertility issues as a result of my condition. Only time will tell. For other women experiencing anything similar to my situation, please know that you are not alone. You’re not damaged goods. You’re not any less of a woman. You CAN get through this. There is hope. I am sharing my story in hopes of easing minds and providing support for anyone who is wondering “why me?” There is a plan and a purpose for your life, and there is hope in becoming a mother despite experiencing lengths of infertility or discovering hiccups in your journey to becoming a mom. We’re all in this together, to lean on and to support and encourage. I hope my story gives you a little dose of that, no matter where you’re at in your pregnancy journey!